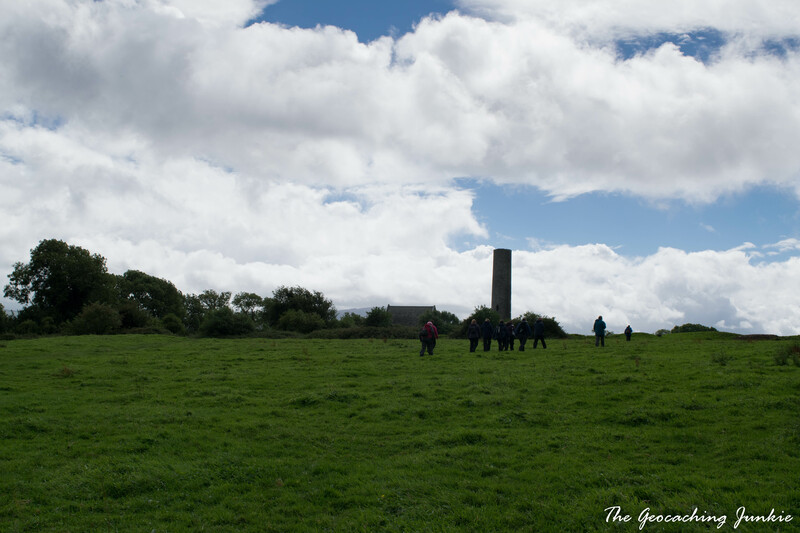 Geocamping, hosted by Eclectic Penguin, has become an annual event in the Irish geocaching calendar. As the name suggests, the idea is that attendees camp at the chosen campsite and then attend various side events across the weekend. Now in its fourth year, this was the second time I attended. 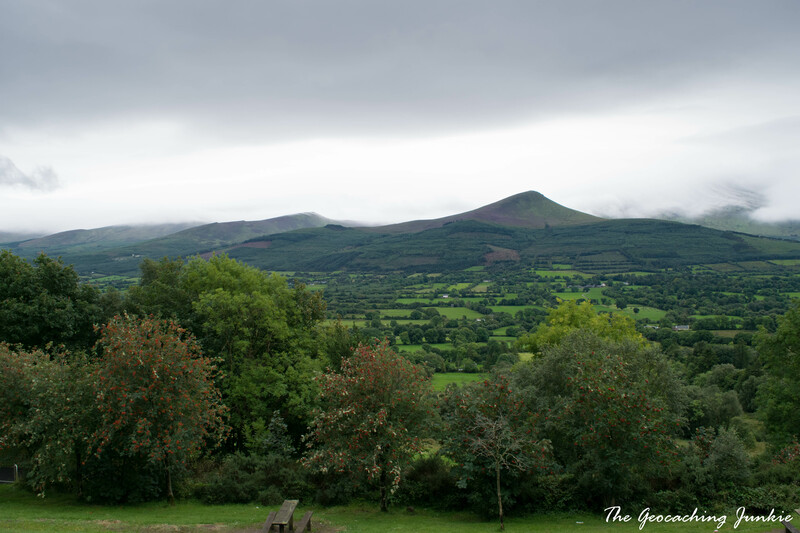 This year, the location was Tipperary, more specifically the picturesque Glen of Aherlow, nestled between the Galtee Mountains and Slievenamuck, south of Tipperary town. 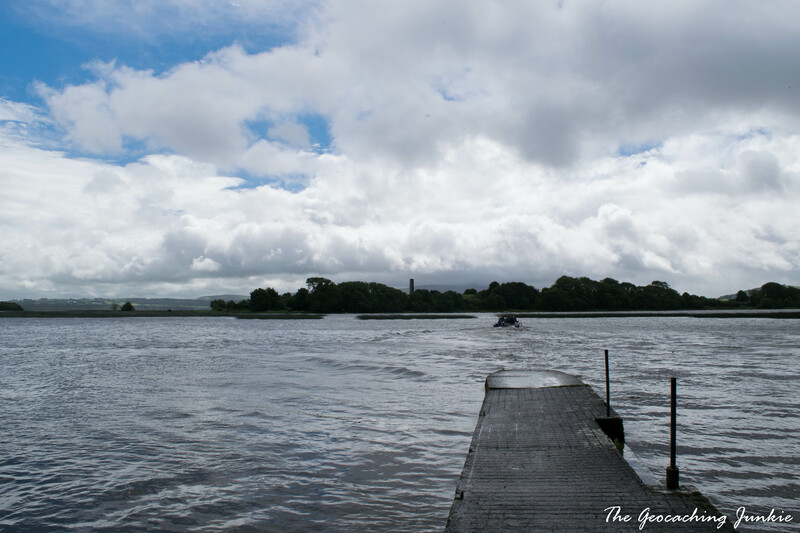 Our first stop on Saturday was Mountshannon in East Clare, for a boat trip on Lough Derg. 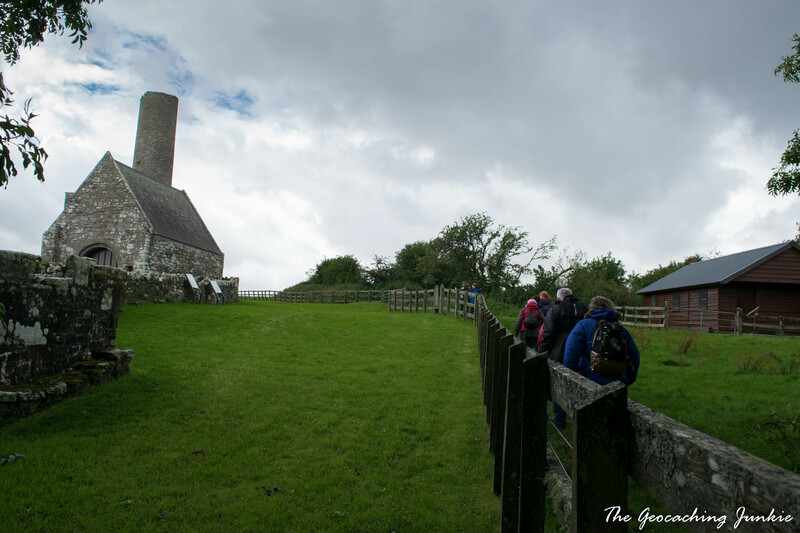 A satellite event on an island is fast becoming a tradition on geocamping weekend and this year was no different as we headed for Holy Island. It was wet and windy on our drive to East Clare but after the weather conditions we had for the trip to Saltee Islands in July, I was quietly confident that the boat would still go. Sure enough, the boatman confirmed we were going, but from an alternative pier a few kilometres around the lake. Cars were quickly relocated and before we knew it, we were on the island after just a few minutes in the small boat. 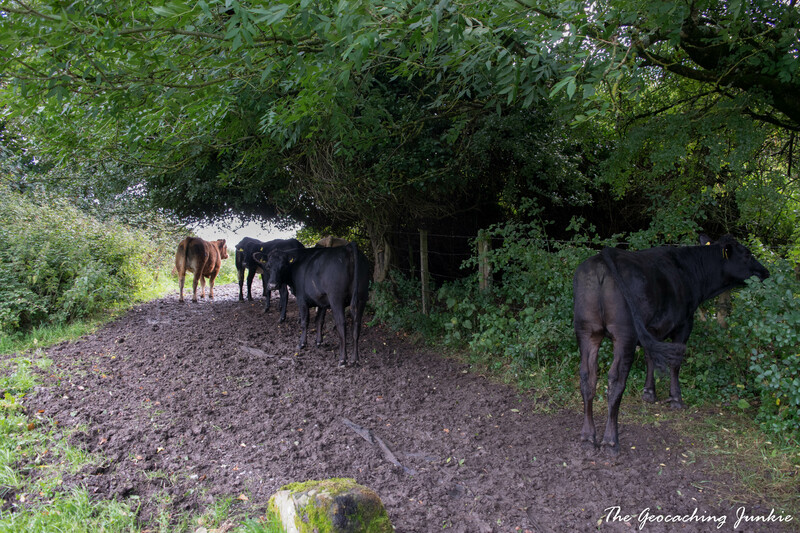 We were met by a herd of young bullocks when we arrived and after a few minutes of confusion about where the path was, or if there was one, we soon realised we had to walk through the bemused cattle to get to the ruins. …used in the 18th and 19th Centuries to seal various deals, including marriage contracts, by the interested parties placing their respective hands through the channel and shaking. 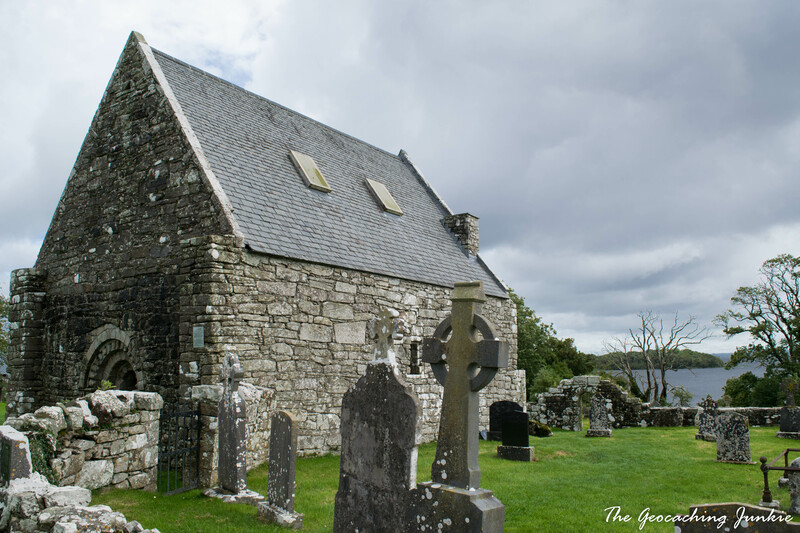 Saint Caimin’s church is the only building with its roof still intact and sits beside the island’s round tower. 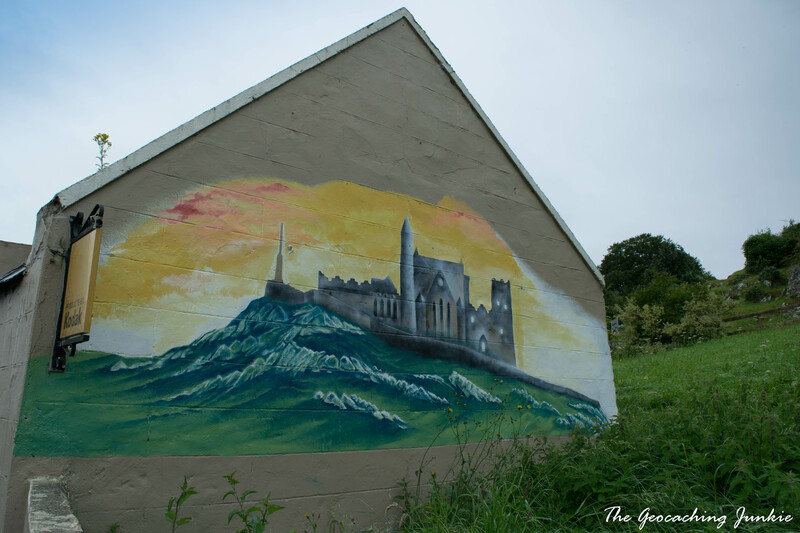 Inis Cealtra was a very popular pilgrimage site in the Middle Ages, when it came to be known as ‘Holy Island’. 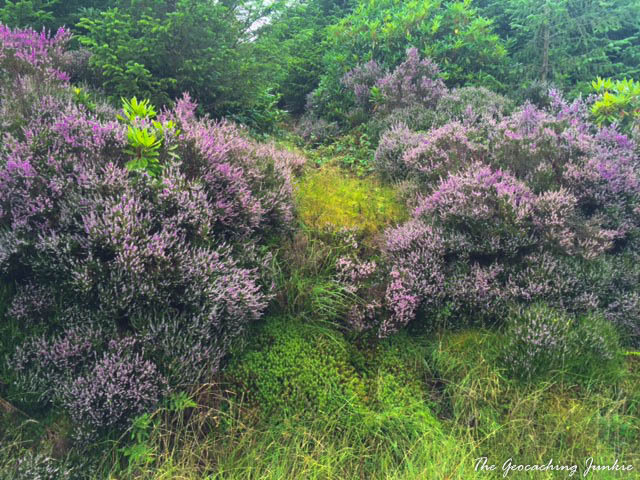 Irish poet William Butler Yeats wrote about it in his ballad, The Pilgrim. 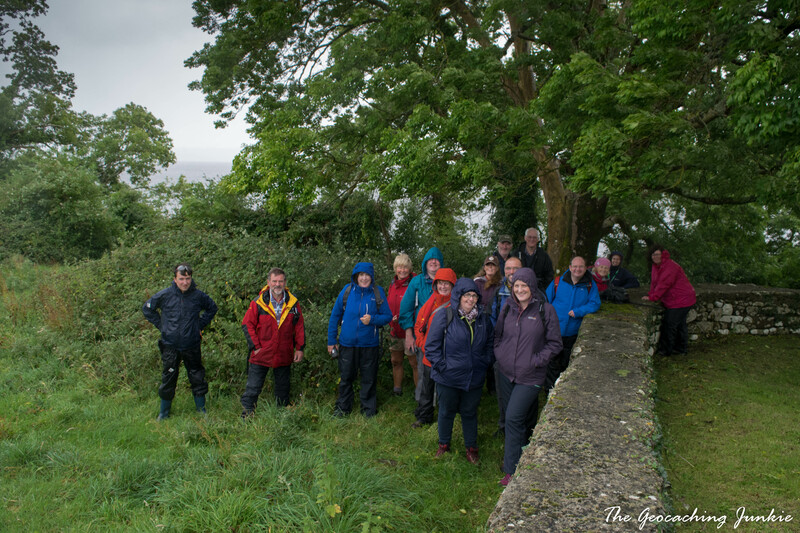 We headed straight for the only traditional cache, Inis Cealtra (GC6KAM2), which is located behind St. Caimin’s Church, near the water’s edge. A quick find ensued just before the rain set in. 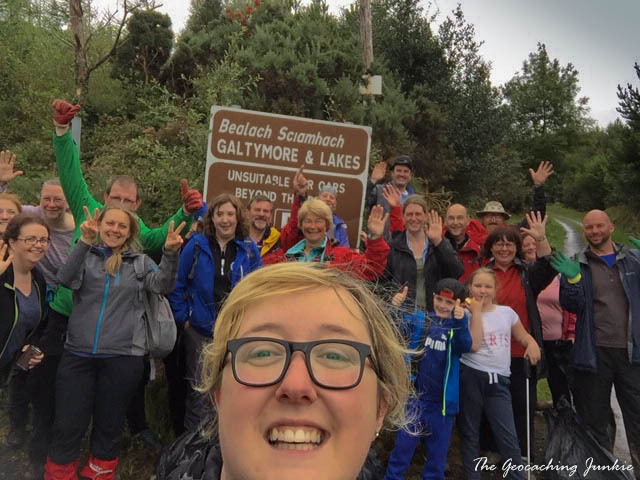 The event (GC6NXPK) was scheduled for 1pm so we decided to find and sign the challenge cache Ireland’s Top 10 Challenge (GC2RQB4) first. The challenge involves finding the top 10 caches in Ireland by favourite points and I still need two more to qualify. It took a good while to make the find, but after some PAF help, The_Mother came up with the goods. Since we were standing under a huge tree and it was still raining, the CO brought the event logbook to us, so I took the chance to take a group photo, after succumbing to peer pressure and climbing up on the wall! Full disclaimer: we didn’t camp. 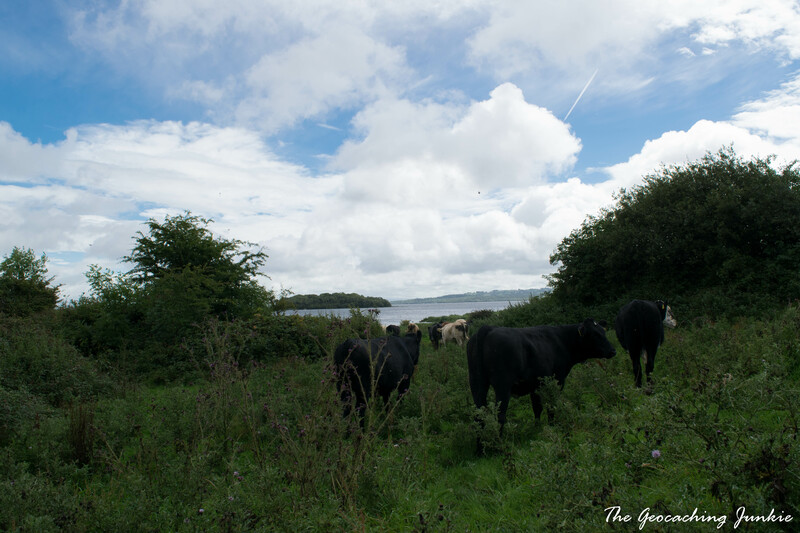 We had very definite plans to right up until a few days before the event, but the thought of pitching a tent and then packing it all away again the very next day really seemed like more hassle than it was worth, so I booked a B&B in Tipperary town at the last minute. 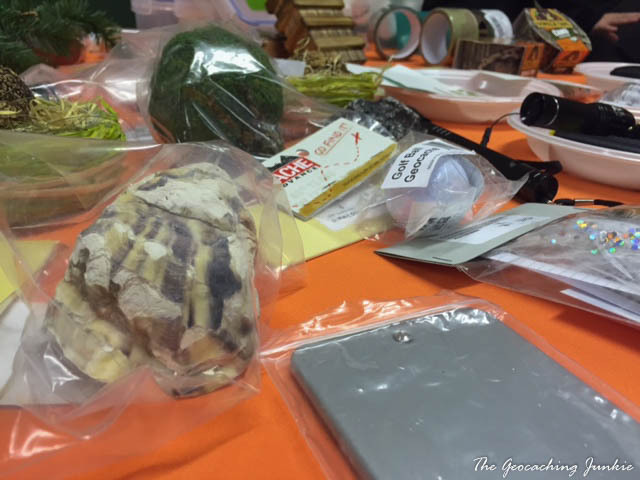 Fortunately, the geocamping event (GC69WNG) was open to campers and non-campers, so we were able to attend. After a lovely meal in Ballinacourty House with cep99 and andreabelfast, I had noticed a new cache pop up on the map with nothing logged online yet. It was placed just outside the campsite so I assumed some of the campers would have nabbed FTF already, but The_Mother and I stopped for a look on our way in. After we were joined by buachaill and polkatart, we were surprised to see a blank log book after making the find! I think everyone inside was enjoying the geochat too much to notice a new cache. That, and the terrible data connection in the area! We finally made it inside the event, where the campsite had kindly allowed the use of the games room for our group, as the gazebo that had been erected looked like it could take flight at any moment! Geocaching Shop Ireland were displaying their wares and I managed to restrain myself enough and limit my purchasing to another album for my coins (though I was very tempted by a gorgeous wooden box to keep them all in!). 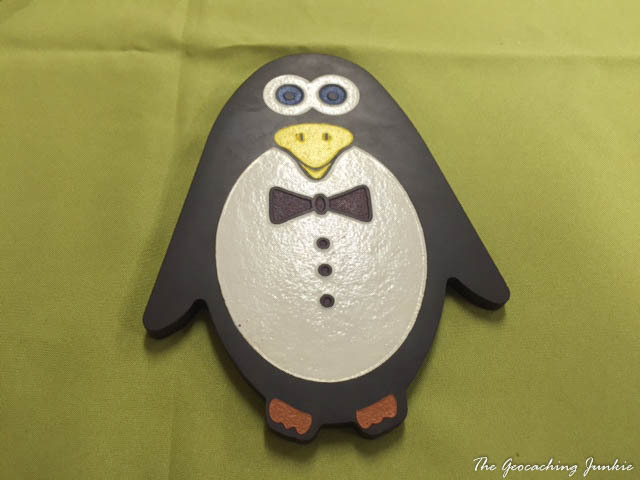 Also on display was Slatey, the MEGA Slate Eclectic Penguin (TB442Y0), which won Best Trackable at the recent Geocaching Awards for UK and Ireland. 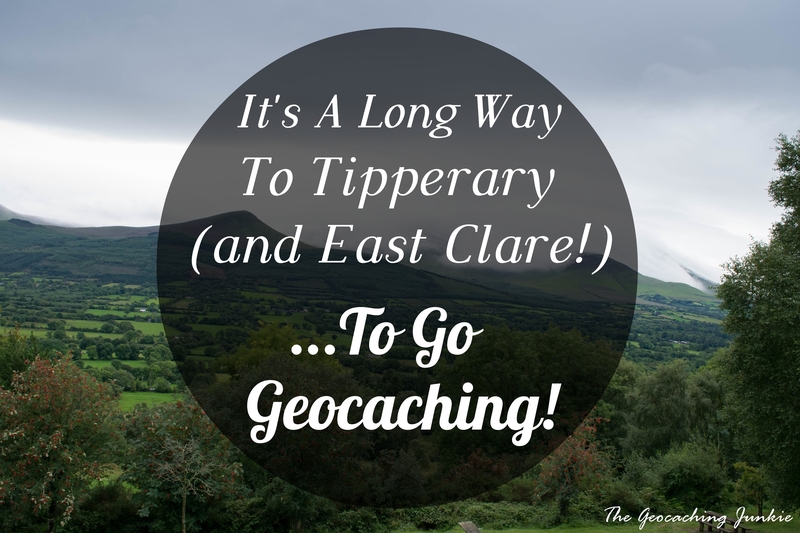 There was just time for a few more geocaches before it got too dark and we headed back to our B&B in Tipperary town. 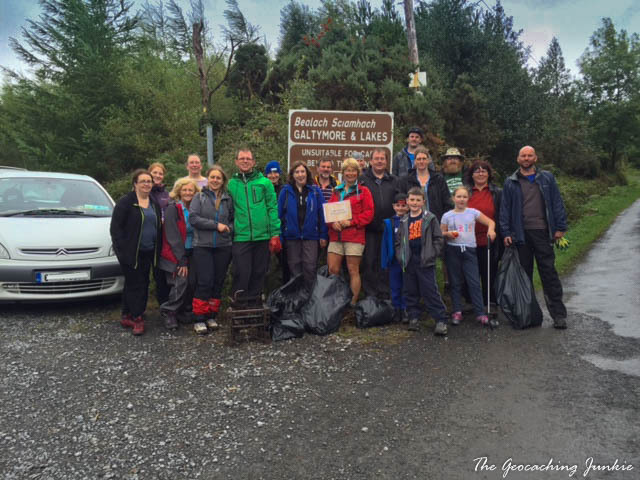 On Sunday morning, we were on the road towards the Glen of Aherlow once again to attend the Galtee mountain trail CITO (GC6NV61). On the way, we drove down quite a few boreens and it struck me that these little roads are the definition of rural Ireland. 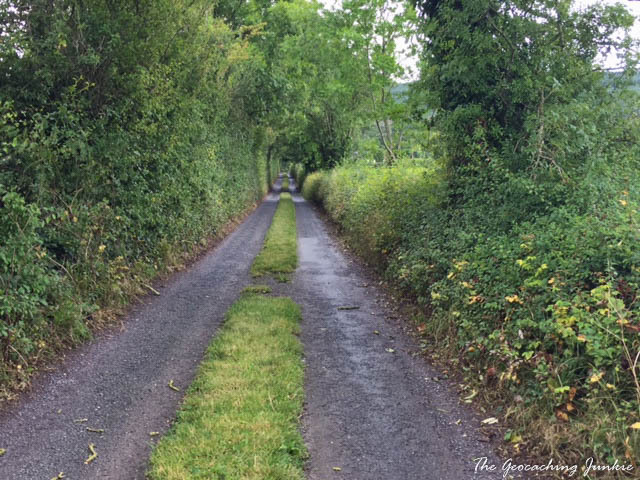 A boreen is a narrow country road with room for only one car, either completely unpaved or if paved, with a strip of grass running down the middle. 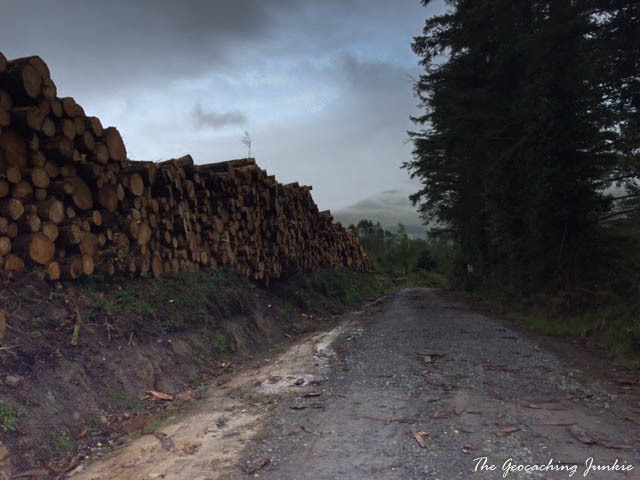 The word boreen comes from the gaelic bóithrín, essentially meaning ‘little road’. Though they may be narrow, the speed limit is usually at least 80km/h, so it may be best to avoid these if you’re a nervous driver! But I digress. After being sent awry by my Garmin nüvi and taking the wrong turn, we quickly righted ourselves and arrived at GZ only 7 minutes late. Small groups were formed and we all picked a trail to go in search for litter. However, there wasn’t really any. It’s a testament to the locals and the hillwalkers who use the trails that they generally bring their litter home with them and leave the routes looking so clean. 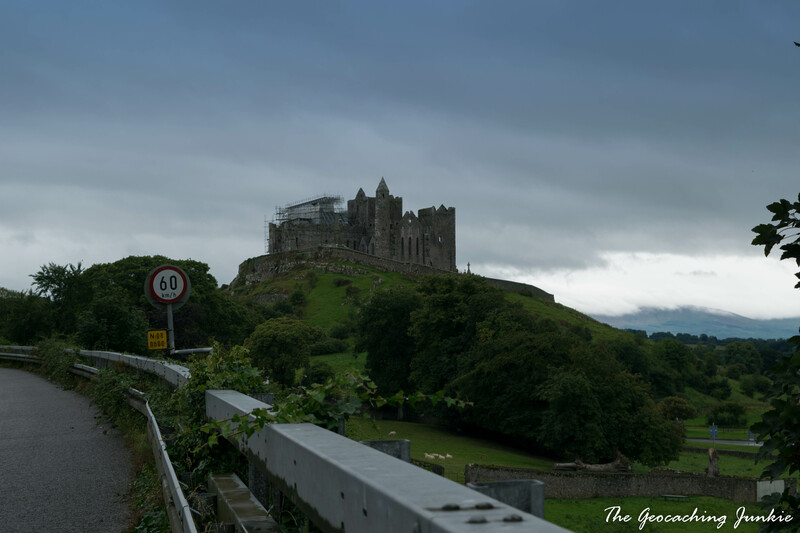 On the way home, we stopped in the town of Cashel to pick up a few smileys and see the famous Rock of Cashel. 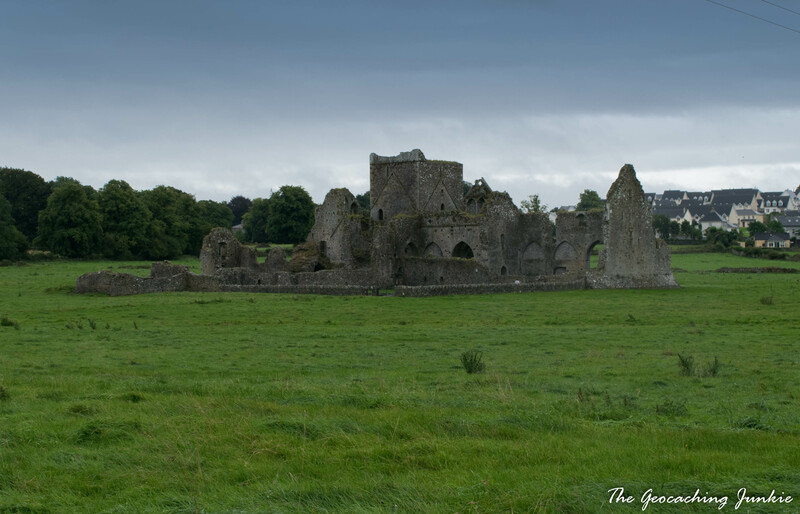 Our first find was Hore Abbey (GC4NFPF) and a place I wouldn’t have known about if it wasn’t for geocaching. 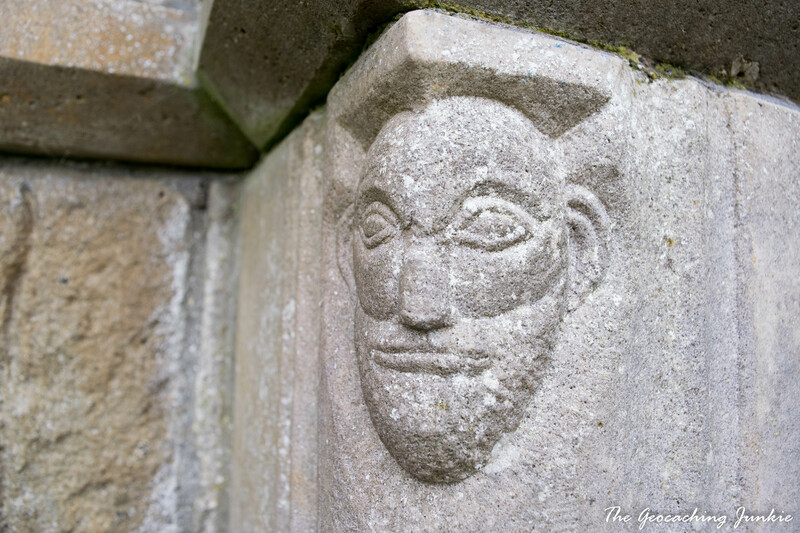 The Rock of Cashel tends to eclipse all other notable features in the town, but Hore Abbey is a magnificent ruined monastery, worthy of a visit on its own and decidedly less teeming with tourists. 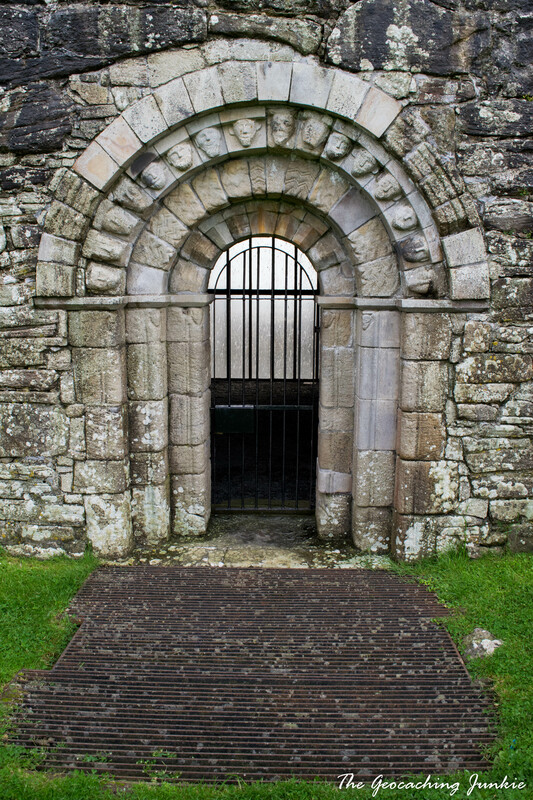 The Abbey was originally Benedictine but given to the Cistercian monks by Archbishop David MacCearbhaill in the 13th Century. 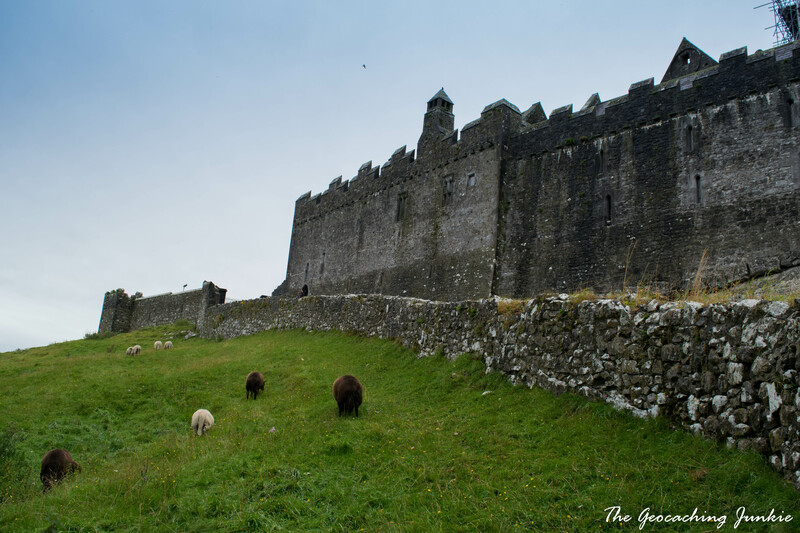 There are two caches in the town relating to the iconic Rock of Cashel: one close to the walls and another further away that gives you a good view of the entire site. We found This Is Near, But The One Out The Road Is Far Away (GC52GET) first, located just outside the walls of the site. The Rock of Cashel is also known as St. Patrick’s Rock, most likely because it’s the reputed site of the conversion to Christianity of Aenghus, the King of Munster, by St. Patrick in the 5th century AD. The site has a number of buildings mostly dating from the 12th and 13th Centuries. The last cache on our way out was Rock of Cache (GC1Y6QR), with a nice view to the Rock and a great way to end the weekend’s caching, aside from the massive rip I got in my favourite geocaching trousers, which meant they had to go in the bin when I got home 🙁 The things we do to get a cache! 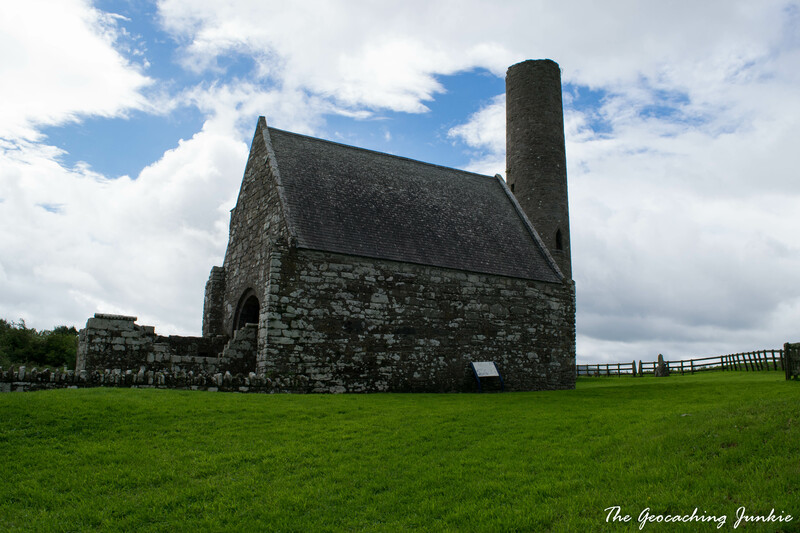 Have you found any amazing historical ruins while out caching? Let me know in the comments!